The new high-gap printhead achieves high-quality printing on cockled transfer papers. Low-cost thin transfer papers are liable to cockling*, which affects the quality of the printhead. To prevent the contact between the printhead and raised surface, a high head gap setting is required. In conventional models, such gap conditions reduce the accuracy of the ink droplet placement. The new TS300P-1800 employs a new printhead that ensures accurate ink droplet placement with a high head gap, thereby enabling high-quality printing on thin papers. * Cockling: Wrinkling of the media surface because of ink absorption. The cockling-reduction transfer mechanism enables high-quality printing on a wide range of transfer papers, from the low-cost thick papers. This high media compatibility reduces the operating cost of the TS300P-1800 without losing the print quality. The media attach to the platen by vacuum suction. Under suction, the cockled media surfaces are smoothed out. Enlarged plates moderate cockling by reducing media uplift and hold down the media immediately after printing. The AMF automatically applies the right tension to the media, thereby maintaining stable media feeding and take-up. The Sb410 costs 20% less than the conventional ink “Sb53“. This competitive price improves the performance of businesses. The Sb410 has superior re-solubility properties. Therefore, dried inks adhered around nozzles are easily wiped off with cleaning solutions. The improved resolvability also ensures more stable ink jetting, thereby improving the print production yield. Moreover, because the ink stability is improved, fewer regular cleanings are required, further contributing to cost reduction. This low-sedimentation ink achieves stable and beautiful printing. Moreover, heat-press transfer printing yields vibrant colors by virtue of the high-density printing. The Sb410 emits little smoke, thereby improving the work environment and increasing the work efficiency during heat-press transfer printing. 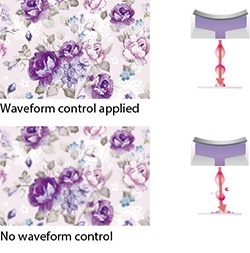 Mimaki’s superior inkjet technology accurately places the ink droplets without losing their perfect circularity. This ensures that texts, lines, and edges are clearly and sharply printed. Mimaki’s unique anti-banding technique MAPS4* is an advanced version of MAPS3. To prevent banding, swath boundaries are overprinted, whereas boundaries prone to banding are printed with fewer ink droplets. The Nozzle Check Unit (NCU) detects nonfunctioning nozzles and automatically cleans them. If the nozzles fail to operate after cleaning, defective nozzles are replaced by non-defective ones until a technician arrives, and printing is continued. This feature enables uninterrupted print operations and continuous productivity. Large ink packs (2 liters) can be installed in the MBIS3. 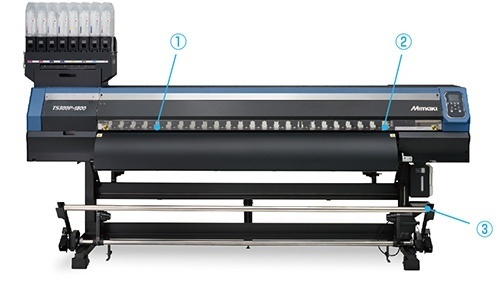 The standard “MBIS3” enables long-time continuous printing at reduced operating cost. The TS300P-1800 optimizes the printing speed and quality to produce the desired print results. For this purpose, it provides a wide range of printing modes, from the draft printing mode (which operates at the maximum speed of 115 m2 /h) to high-quality printing mode. TxLink3 Lite or RasterLink6 is bundled according to user’s request. 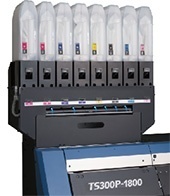 *Use of the 2L Bulk Ink Packs may require purchase of a MBIS unit.